Instruct, advise, console, comfort, forgive, and bear wrongs patiently. Pittsburgh Mercy’s heritage of hope began in 1831 with the founding of the Sisters of Mercy by Catherine McAuley, a courageous young heiress who used her inheritance for good. 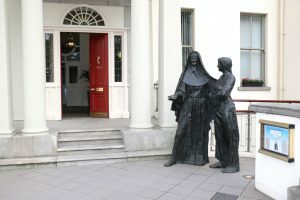 To improve the lives of women and children, Catherine opened a house of mercy in the middle of the financial district on Lower Baggot Street in Dublin, Ireland. Catherine wanted to help connect persons of means to those most in need. 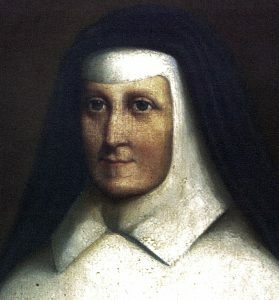 Following in Catherine’s footsteps, seven courageous Sisters of Mercy – Mother Frances Warde, RSM; Sister Josephine Cullen, RSM; Sister Veronica McDarby, RSM; Sister Elizabeth Strange, RSM; Sister Aloysia Strange, RSM; Sister Philomena Reid, RSM; and Sister Agatha O’Brien, RSM set sail for the United States in 1843. Their mission: To serve the poor, sick, and uneducated – especially those most in need. The Sisters settled in Pittsburgh, where they opened a convent and established a grade school in their home. A few years later, they founded Mercy Hospital. During the Depression, they started what is today known as Carlow University. These were the very foundations of Mercy ministries across the United States. 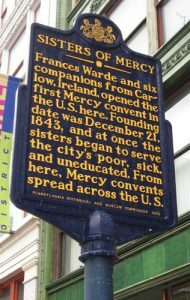 An historical marker on Penn Avenue, Downtown Pittsburgh marks the spot of the first Sisters of Mercy Convent in the United States. Nearly 175 years after the Sisters of Mercy first arrived, Pittsburgh Mercy is a dynamic, innovative link in the “circle of Mercy” worldwide. Pittsburgh Mercy colleagues carry forward the tradition of service through the same “feet on the streets” approach of the Sisters. Pittsburgh Mercy reaches out, goes to communities, and seeks out the vulnerable. We offer help – and hope – to those who are most in need: persons with mental illnesses, addictions, and intellectual disabilities, and persons who are experiencing homelessness, abuse, and other forms of trauma. Stewardship: We honor our heritage and hold ourselves accountable for the human, financial, and natural resources entrusted to our care. Courage: We dare to take the risks our faith demands of us. “Building unity and hope in the community.” – Heather M.
“Ability to see every person as cherished.” – Brian M.
“An encouraging resource that empowers the helpless.” – Hoda L.
“A compassionate heart accompanies me with each step.” – Elizabeth B. “Comfort of friends with a helping hand.” – Margaret V.
“Caring people who help individuals in need.” – Shirley P.
“Helping individuals become active community members” – Rebecca P.
“Experiencing God, one person at a time.” – Daniel K.
“Another chance, another chance, and another chance.” – Barnett H.
“Helping our [individuals] to reach their goals.” – Helen S.
“Open hands, open doors, open hearts.” – Denise B. “Person-centered, wholistic care and recovery.” – Terri W.
“The light of love that brightens the darkness.” – Wayne M.
“A beacon of hope and healing.” – Michael H.
“Prayers answered. Put me where I’m needed.” – Dennis A. “Changing the present to prepare for the future.” – Rex B. “Walking together alongside.” – Katyanee S.
“Compassion built from a heartfelt foundation.” – Kristine I. “A healing presence in the communities we serve.” – Curt C.
“The ability to live with meaningful purpose.” – Bernadette D.
“Helping others achieve personal levels of independence.” – Antoine C.
“A safe place to turn without judgement.” – Stacy N.
“A foothold if you lose your step.” – Robert R.
What does “mercy” mean to you? How do you live mercy? Share your comments on the post of this story on our Facebook page. Linda K. Ross is the director of communications at Pittsburgh Mercy.